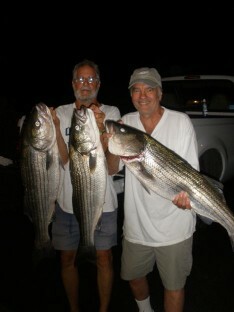 Free Fishing Reports > Northeast > New York > North Shore > After boat repairs, Bass bite was Slamming! After boat repairs, Bass bite was Slamming! This Evening , Capt. Skip had to do some power steering repairs, and when the job was a quick success, Kenny, Ron, Ravioli Ron, and Mike jumped aboard for a non-stop slamming bite of Bass to 22 lbs. 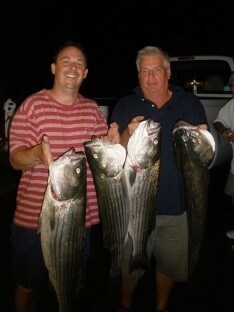 Mike and Kenny both had 20 + lb. fish, while the others weren’t far behind. In all, everyone limited out and also threw back 2 dozen Bass. What a awesome evening. The bite is back in full swing!